(AP) ISLAMABAD - A Taliban emissary sat face-to-face this week with a senior Afghan government official responsible for peace talks in a rare high-level gathering between the bitter adversaries, an official said Saturday. The encounter at a peace and reconciliation conference in Kyoto, Japan, was a rare a positive sign in faltering attempts to find a peaceful end to the protracted conflict in Afghanistan. It also provided an unusual opportunity for Afghan President Hamid Karzai's government to sit down with its enemies  the Taliban and the Hezb-e-Islami insurgent group. Siddiq Mansour Ansari, a peace activist who was invited to attend the meeting this week at Kyoto's Doshisha University, said it was the third peace and reconciliation conference organized by the school but the first time the Taliban had sent an emissary. The Taliban's former planning minister, Qari Din Mohammed Hanif, took part in the conference "to explain the policies of the Islamic Emirate," Taliban spokesman Zabilullah Mujahed told The Associated Press by telephone. Taliban officials rarely travel abroad for public meetings, and Mujahed didn't say how Hanif, an ethnic Tajik from Afghanistan's northeastern Badakhshan province, made the trip to Japan. Although a senior member of the Taliban and a member of the movement's political committee, Hanif is not on any wanted list. The Afghan government was represented by Mohammed Masoon Stanikzai, a senior member of the government's High Peace Council, which is responsible for talks with the insurgency. Ansari said the conference was not intended to find a peace settlement but to air ideas and differences. "In this third Doshisha conference all the parties presented their ideas and agendas but there were no concrete agreements," he said. Karzai and U.S. officials are trying to draw the Taliban back to negotiations toward a peace deal between the Afghan government and the Pashtun-based insurgency that would end a war that American commanders have said cannot be won with military power alone. The Taliban have refused to negotiate with the Karzai government, saying the U.S. holds effective control in Afghanistan. The Obama administration has set a 2014 deadline to withdraw forces, and is trying to frame talks among the Afghans beforehand. Hanif said peace talks with the United States in Qatar were suspended earlier this year after the U.S. reneged on a promise to release Afghans from the military prison at Guantanamo Bay, Cuba, and allow them to go where they pleased, according to Ansari. In an attempt to restart the stalled peace talks, the Obama administration is considering sending several Taliban detainees from Guantanamo Bay to a prison in Afghanistan, U.S. and Afghan officials told The Associated Press. Under the proposal, some Taliban fighters or affiliates captured in the early days of the 2001 U.S. invasion of Afghanistan and later sent to Guantanamo under the label of enemy combatants would be transferred out of full U.S. control but not released. It is meant to show more moderate elements of the Taliban insurgency that the U.S. is still interested in cutting a deal for peace. But Mujahed said the White House's proposal won't coax the Taliban back to the negotiating table. "We want the prisoners to be freed and allowed to go anywhere," he told the AP Saturday. "But we do not want that they be released from one prison and shifted to another prison, which means from Guantanamo to Bagram. The Americans are not sincere in talks and they are responsible for the stalemate." Under the new proposal, Guantanamo prisoners would go to a detention facility adjacent to Bagram Air Field, the largest U.S. military base in Afghanistan, officials of both governments said. The prison is inside the security perimeter established by the U.S. military, and is effectively under American control for now. It is scheduled to be transferred to full Afghan control in September. Meanwhile, the Taliban and Hezb-e-Islami, despite reports of infighting in Afghanistan, found common ground at the Kyoto conference in their demand that all foreign troops, including trainers, leave Afghanistan after 2014. 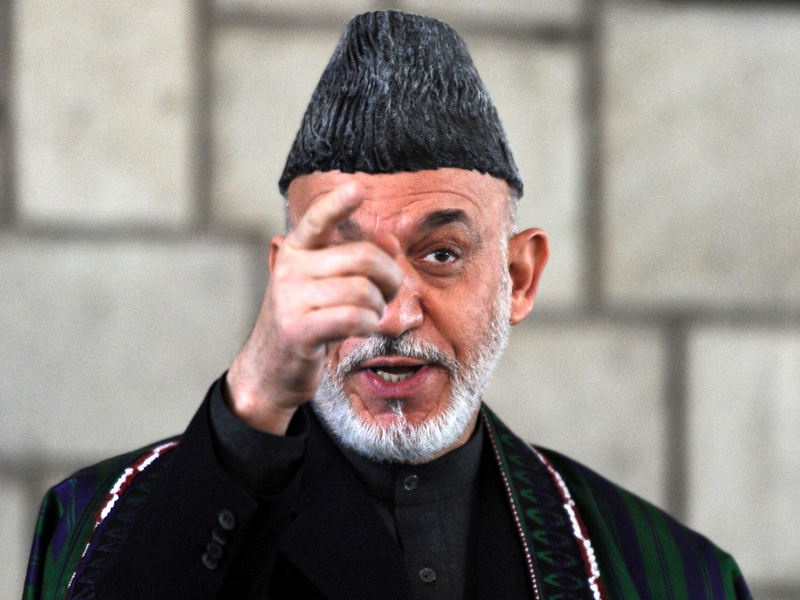 "The Taliban insisted on complete withdrawal of foreign troops from the country after 2014 and called the Karzai government a puppet saying they would not negotiate with Karzai or his government," Ansari said. Hezb-e-Islami is a radical Islamist militia that has thousands of fighters and followers across the north and east. Its leader, powerful warlord Gulbuddin Hekmatyar, is a former Afghan prime minister and one-time U.S. ally who is now listed as a terrorist by Washington. His party representative, Dr. Ghairat Baheer, has previously held talks with U.S. officials in Kabul, including U.S. Marine Gen. John Allen, the top commander of American and NATO forces in Afghanistan, and U.S. Ambassador to Afghanistan Ryan Crocker. Ansari said the conference will seek to set up an international commission that could act as a peace broker between the Afghan government and insurgents. There was no agreement on this commission at the conference, he said. "We are proposing an international commission for this because no one trusts each other," he said. "They didn't trust the High Peace Council of Afghanistan and now we hope they will agree to an impartial international commission," made up of Islamic scholars, academics and civil society representatives. "It's been 11 years and billions of dollars have been spent and there has been no change and good brought to Afghans," said Ansari. "We need to stop this war because it is affecting not only Afghanistan but it is a big headache to the international community as well."